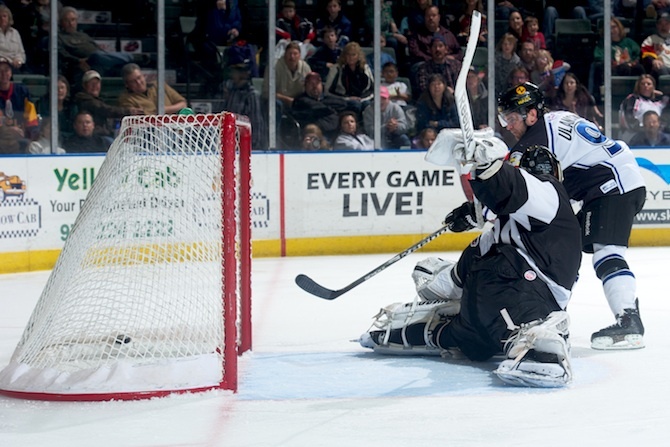 LOVELAND, Colo. – The Colorado Eagles defeated the Las Vegas Wranglers, 5-3, moving within a pair of points of the Western Conference’s 2nd place team. With the victory, Kyle Jones also moved up a pair of rankings lists; he is now tied for the ECHL lead with 15 wins, and he can now claim the second-most wins in franchise history with 44. Jones and the Eagles’ penalty killers got the game off on the right skate for Colorado as they killed consecutive Wranglers power plays early in the first period. Shortly thereafter, Liam Huculak drew a man-advantage chance for the Eagles, and they would capitalize to take a lead at 11:13. On the goal, Huculak moved the puck to Steve Haddon, who found Michael Forney in the right circle. Colorado made it 2-0 less than four minutes later with another power-play tally — against a Las Vegas team that entered the game tied for 1st in the league on the penalty-kill — when Jon Landry’s shot from atop the left circle was deflected past Joe Fallon. Aaron Slattengren, back in the lineup for the first time since November 23, gave the Eagles a 3-0 lead in the final minute of the first frame. Alex Penner made the goal possible by powering his way into the offensive zone and then finding Slattengren in the low slot. But less than 30 seconds later, Eric Lampe added to his league leading goal total — and tied Chad Costello’s season high point streak of 14 games — by putting home a puck as he skated un-checked in the low slot following a Channing Boe shot from the left point. In the second period, Las Vegas climbed back to tie the game at 3 with a pair of goals off of rushes. The first came at 4:40 when Josh Lunden sent a great backhand pass from the right circle to Scott Campbell crashing the left post. The second came at 13:17 when the Wranglers worked an odd-man rush coming out of the penalty box as Lampe fed a pass through Luka Vidmar’s legs to Geoff Paukovich. Colorado re-took the lead, 4-3, at 16:53 when Penner sent a pass into open space and Patrick Cey picked it up entering the offensive zone. The rookie forward then beat Fallon’s glove with a shot from the left faceoff dot. The Wranglers had a golden opportunity to knot the game back up with 1:55 of 5-on-3 play at the end of the period, but the Eagles got an inspired effort from their penalty killers that earned a standing ovation from the home crowd. The Eagles were able to add an insurance goal midway through the third period when Riley Nelson found Kevin Ulanski with a long lead pass, sending his veteran linemate on a breakaway that ended with Ulanski putting a backhand shot past Fallon’s left leg. Colorado held on from there. The teams will compete again Saturday night.